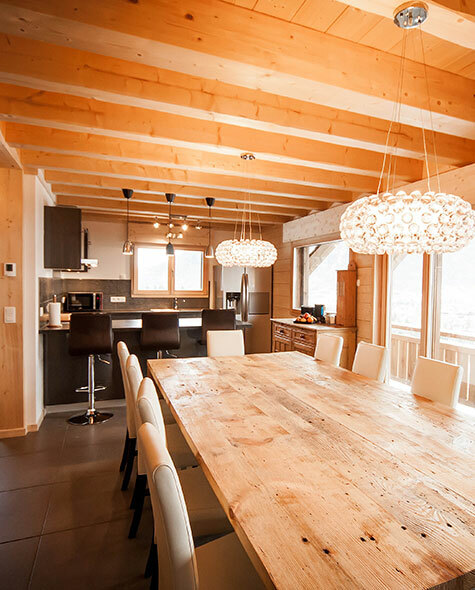 Chalet Le Cabri offers a stylish blend of traditional Savoyarde design with contemporary features and modern amenities,from a renowned local artisan company to a high specification. Underfloor heating and a designer rotating wood-burner provide a warm ambiance throughout the open-plan living and dining area. The kitchen is fitted with Bosch appliances and includes an American fridge freezer with ice/water dispenser, dishwasher, double ovens and induction hobs. There is a bar with stools for watching the professional chef prepare your sumptuous evening meals. Satellite TV, iPad and Apple TV are also available for viewing from the comfortable sofas. Bedroom 1 – Super King-size bed (or twin), has direct access from the driveway and is suitable for wheelchair users, with an ensuite wet-room. From this room the dining and living area can also be accessed. Bedroom 2 – Super King-size bed (or twin) with double doors leading onto a private balcony. Ensuite shower room. Bedroom 3 – Super King-size bed (or twin/triple) with double doors leading onto a private balcony. Ensuite shower room. Bedroom 4 – Super King-size bed (or twin/triple) plus a single bed with double doors leading onto a private balcony with amazing mountain views. Ensuite with bath and shower. Bedroom 5 – Super King-size bed (or twin) with double doors leading onto a private balcony with amazing mountain views. Ensuite shower room.